In an effort to further tidy up your workshop, we've made a concerted effort to figure out exactly what sort of storage you might need. 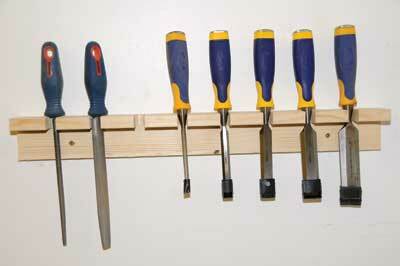 This series of four handy tool racks and shelves should be just the job. No one turning the air blue searching for the spanner that you put down "only a second ago." Chisels are one tool that really must have a proper rack or else they roll around the bench getting blunt and dirty, and can be a hazard. I marked out the spacings so that wide bladed as well as narrow chisels would fit comfortably side-by-side. 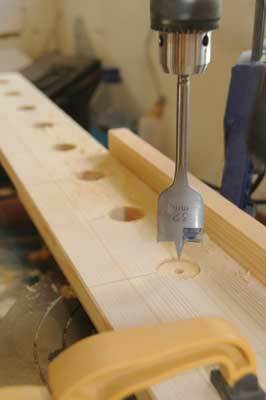 I used the drill press and a homemade sub table to drill 16mm diameter holes, this being a suitable size to accommodate the neck of all my chisels. 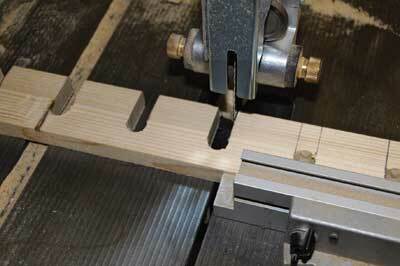 The slots were next cut out on the bandsaw using a mitre fence, however this is an easy job with a tenon saw. 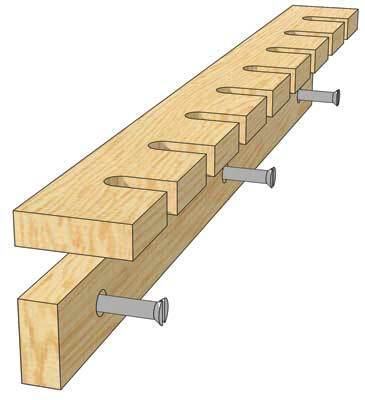 The supporting batten is screwed or nailed on and just touches the rear edges of the cutouts so that the chisel blades sit well against them - the blades should have their guards fitted. 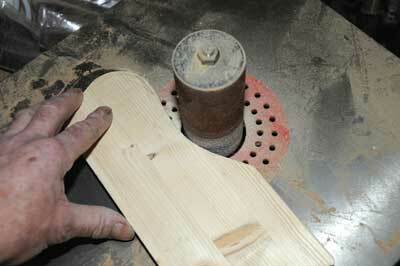 So often handplanes sit upright with a block underneath to protect the blade edge. However, it is perfectly possible to lie the plane down and shape the shelf oversize to fit the shape of it. Simply draw by eye around the plane about 25mm away from it, then bandsaw the shape out giving yourself some relieving slots to release the blade as you come to the end of a cut, or the middle of a tight radius. If you have the luxury of a bobbin sander it is a neat way to smooth edges; alternatively use a hand file or rasp, and sand. 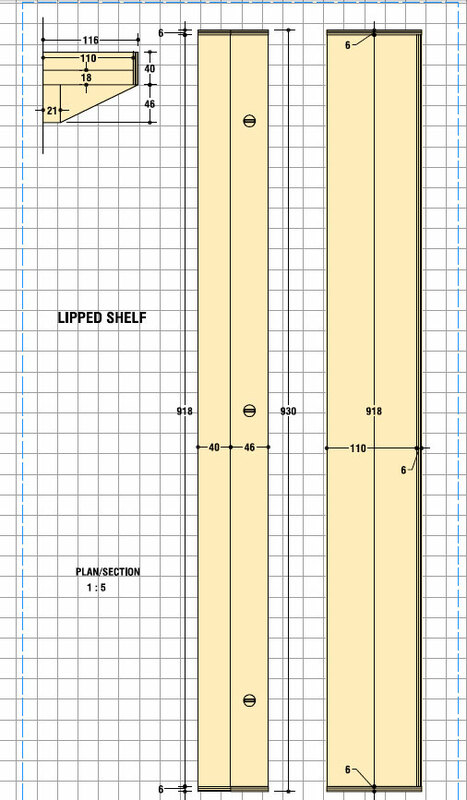 Lastly, fix to a short batten and then to the wall. It's interesting how narrow a shelf can be and still hold a lot of stuff. I used a 225mm wide pine laminated board for all these projects, slit down the middle on the tablesaw, although you can buy an ordinary board of the final width if you want. I screwed a 50 x 25mm batten underneath and added a birch ply lip and bracket ends to help support it, with PVA glue and slim nails or panel pins used to hold them on. 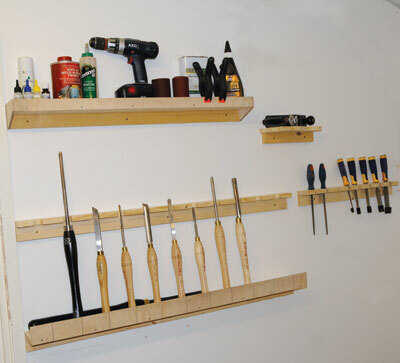 The workshop wall was chipboard at this point so three twinfast screws, a spirit level and cordless drill fixed it. As you can see, it has plenty of stuff loaded onto it with the all important lip ensuring nothing accidentally falls off. 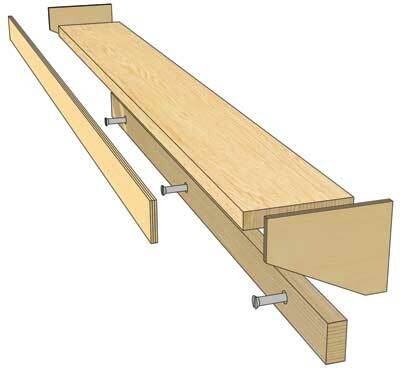 It can be any length you want although over four feet long and you may need a centre bracket. This is an interesting one as it was made for a woodturner who knew exactly what they wanted so it had to be right. The top support is 50mm deep but the circular cutouts that hold the tool blades meant that I had to use 110mm wide stock and drill a series of holes offset slightly to the back on the drill press with a 32mm diameter flat bit. 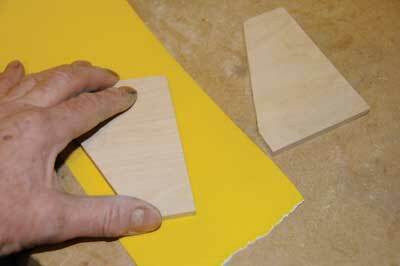 The board was then slit on the saw so most of the cutouts remain. 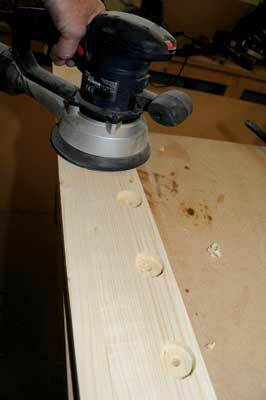 The waste piece was next cut down on the saw, turning it into a batten for fixing the support strip to the wall. 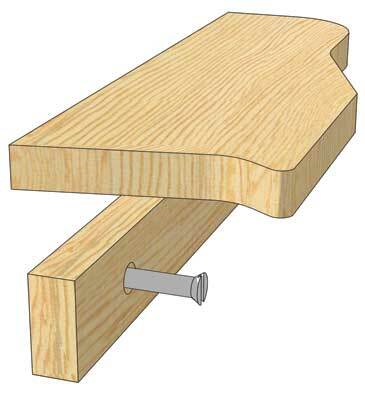 The lower shelf is 104mm deep and has holes in matching positions to the support strip but are 'stopped' at about 7mm deep - this gives enough depth to hold round ended handles including ones with a brass pommel or stud in the end. 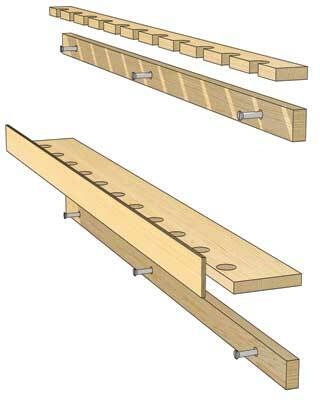 The holes are close to the front edge so the tools lean at a suitable angle, and the glued and pinned lipping prevents them slipping off the shelf. Note the felt tip lines on the front - these make it visually easier to place the tools back in their respective holes. "No more turning the air blue searching for a spanner that you put down only a second ago"